Archive for tag "Organic PV"
Ecosummit TV: Thibaud Le Séguillon, CEO of Heliatek, presents his Organic PV startup at ECO12. 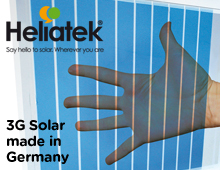 OPV is the third generation of solar technology and Heliatek is the global leader. The Dresden-based startup recently announced another efficiency world record of 10.7%. The efficiency roadmap goes up to 15-20%. But the real advantage of Heliatek is low cost per kwh as well as very green manufacturing processes without toxic materials. Now Heliatek looks for €60M for their Fab 2. 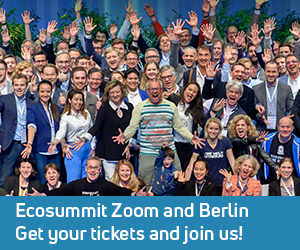 Thibaud on Ecosummit TV is just the perfect sales pitch for their new financing round. 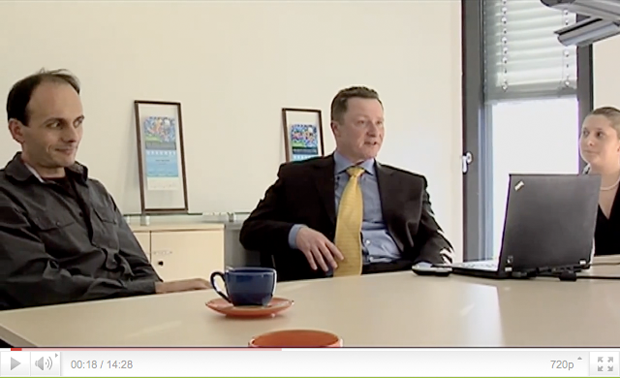 Ecosummit TV: Prof. Karl Leo is Germany’s poster child when it comes to co-founding new smart green startups out of university. In his case, it’s the University of Dresden where he leads the Institute for Applied Photophysics. He simultaneously works with Fraunhofer IPMS to create even more value. Karl Leo is famous for co-founding Novaled which is heading for NASDAQ as well as Heliatek. His new startup that currently looks for smart green VCs invents OLED Microdisplays which are super energy efficient as you put them directly in front of the eye. Karl Leo is a role model for Europe’s university professors and we are happy that he joined Ecosummit 2012. Congratulations to Prof. Dr. Karl Leo, Dr. Jan Blochwitz-Nimoth and Dr. Martin Pfeiffer for winning the Deutscher Zukunftspreis 2011 (DZP11) today. The DZP11 is awarded by the German President and includes €250K prize money. I am very proud of this trio and their work. Karl Leo is university professor at TU Dresden and co-founder of both Novaled and Heliatek, Jan Blochwitz-Nimoth is co-founder and CSO (Chief Scientific Officer) of Novaled and Martin Pfeiffer is co-founder and CTO of Heliatek. It’s all about organic electronics, organic LED and organic PV made in Dresden, Europe’s leading cluster for green photonics. In his talk “PV – Is the Party Over?” at Ecosummit 2011, Frank Siebke, Investment Director at Good Energies, gives a detailed overview of the current and future trends of the PV industry from an investor’s point of view. Frank says that the party is not over yet, solar has still a huge potential. After polycrystalline silicon solar (1G) and thin-film solar (2G) now we enter the third solar technology generation (3G) which is organic PV (OPV). Our new Ecosummit TV episode brings you more unknown secrets and untold stories about Europe’s leading OPV provider. Dresden is the place to be, explains Dr. Martin Pfeiffer, Founder and CTO of Heliatek: “I think I am not exaggerating when I say that Dresden is probably the best place in the world for organic electronics due to a high-quality cluster of research and production partners working with us.” We like this company and we believe Heliatek has a bright economic and ecological future. We need it, too! Organic PV (Photovoltaics) is very promising 3G Solar techno. We also call it Green Photonics. Heliatek is a German pre-revenue Cleantech startup with 50 employees currently setting up their first factory. Moving from lab to fab, Founder & CTO Dr. Martin Pfeiffer and CEO Dr. Andreas Rueckemann give hope. They believe their new ecofriendly solar cells made in Dresden will provide more energy for less money with very little ecological footprint. This nextgen green technology made ubiquitous with factories of the future can help us overcome nuclear disaster as it unfolds in Fukushima in Japan. We must reinvent our economy and repower it by 100% renewable energy and products. Let’s go smart green now and do the right thing!